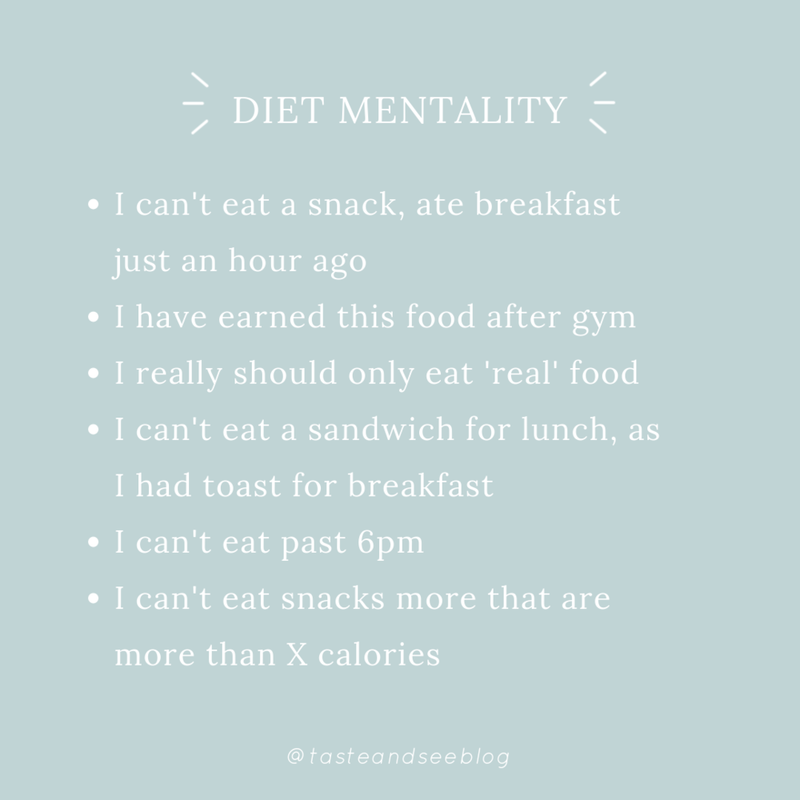 I shared a short post on Instagram last week highlighting some of the characteristic differences between having a Diet vs. Non-Diet Mindset. You might be thinking, 'Why on earth is this important? ', so I thought that it would be worthwhile going into a bit more detail about that here on the blog. The first principle of Intuitive Eating is to Reject the Diet Mentality. It is also arguably most important steps of your journey towards eating more intuitively and finding peace with your body and food. We know that diets give us false hope and empty promises - they don't work in the long-run for most people, they mess up our relationship with food, they cause us to lose trust in our bodies, and they make us feel bad about the shape and size of the body that we do have. The idea of not being on a diet, or not being rigid with the foods that you are and aren't allowed to eat, can be really scary. Even when you have reached the end of your tether and are just exhausted of the ongoing diet-cycle that just never seems to end. Ditching the diet mentality can be really difficult because it requires you to break-up with chronic restriction, micro-managing your food intake, fad diets, the idea that you need to be on a diet, and addressing some of the societal pressures associated with body weight and size to make room for a healthier relationship with food and body image. Why can ditching the diet mentality be so scary? If I stop dieting, I'll never stop eating bad foods - Here's the thing, dieting and restriction can often be a trigger for overeating. When you have been underfueling your body and being very restrictive with certain foods, it's inevitable that your body will start to feel deprived and will do everything that it can to get enough energy. When we place certain foods on a pedestal, they become a kind of 'forbidden fruit', and generally when we decide not to every eat them again they become the only thing we can think about. There are so many complex physiological systems involved in this that I probably won't have time to go into in today's post, but just know that once your body learns and trusts that you will feed it adequately, the intense drive to eat will decrease. I won't know how to eat if I'm not on a diet that tells me how - Dieting causes us to disengage and lose trust with the innate signals that are meant to guide our eating. When we have been caught up in dieting and restrictive eating for a period of time, it can feel a bit overwhelming not to have rules and structures in place that tell us what to do. Tribole & Resch  liken this to swimming for the first time: 'The feeling of being surrounded by water can be terrifying to the novice swimmer…Similarly, being surrounded by food can be terrifying to the chronic dieter, who is learning how to eat again'. Here's the thing, you will only be able to learn once you jump in the water and start to swim. As you take the plunge and stop relying on diets to guide your eating choices, you will be able to trust your body's cues. I will be completely out of control - Diets and rigid meal plans give us a false sense of structure and control, but in reality they teach us to distrust our internal signals and rather rely on external rules that tell us what, when, how much, and in what situations we are allowed to eat. 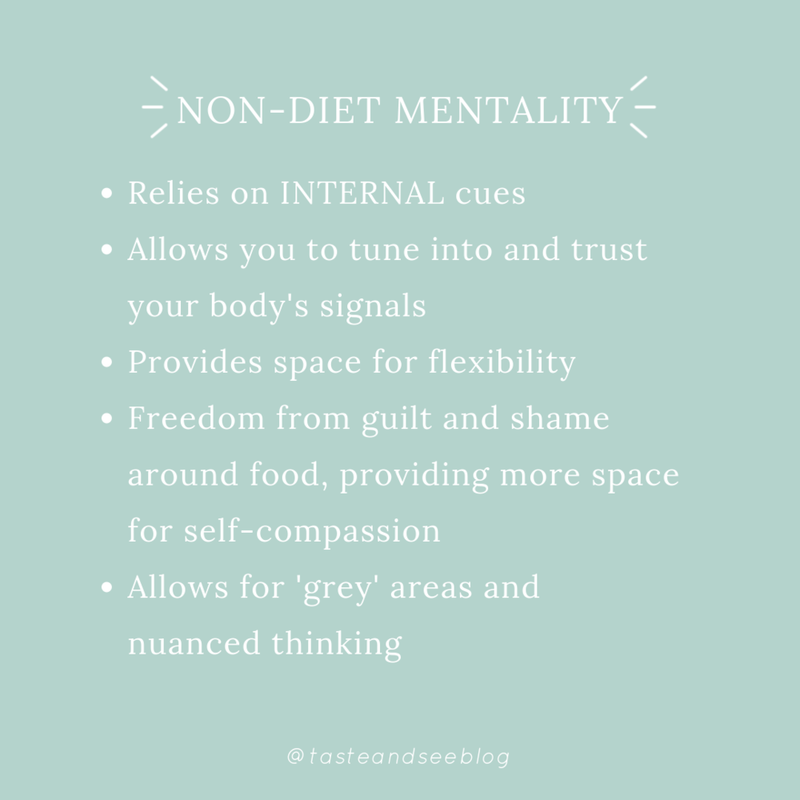 Adopting a non-diet mentality, on the other hand, allows us to learn to trust our own thoughts, feelings, and experiences, and tap into our hunger and fullness cues in a way that truly allows us to be empowered to make decisions about food and our bodies that are right for us. 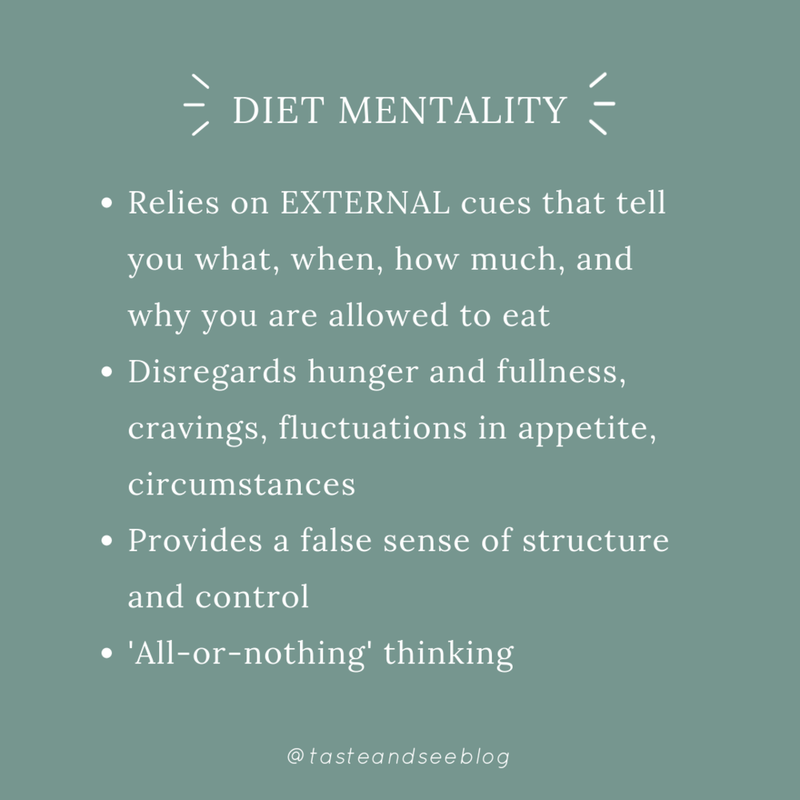 What is the 'Diet Mentality'? Having a non-diet mentality allows you to tap into your internal cues. It allows you to tune into and begin to trust what your body wants and needs, and it provides more space for space and flexibility. It does not view the body as something that needs to be 'fixed’ or manipulated, and ultimately this mindset sets you free from feelings of guilt and shame around food, and provides a lot more room for self-compassion. Counting 'macros’ and limiting carbohydrate intake - You may not be counting calories, but are hyper-aware of the amount of carbohydrates, fats, and proteins that you eat on a daily basis. Only eating 'safe foods’, and not allowing yourself to eat those that are ‘off-limits’ - This could mean always choosing 'low calorie', 'low fat', or 'low carbohydrate’ snack options, even when they aren't exactly what you are craving or desire. Eating only at certain times of the day - For example, not eating after 7pm at night, even if you are really hungry. Feeling ‘bad’ or guilty after eating 'treat’ foods - This could include saying out loud how ‘bad’ you have been, or can involve doing extra exercise as a way of paying penance for eating those foods. Restricting food - Often this can happen before a big event, or when we are feeling particularly dissatisfied about your body. Curbing hunger by using other things - It's pretty easy to see how this can be considered to be normal with magazine headlines that read 'Are you really hungry? - 5 ways to curb your hunger', and promote drinking water, coffee, or diet drinks in place of actually eating real food. It starts with a paradigm shift , which requires us to break out of the status quo and old ways of thinking, to start recognising diet culture in everyday life, and to give it a big old ‘NO THANK YOU’. We need to recognise and acknowledge the damage that dieting causes us (you can read more about this in one of my old blogposts), and that it's something that we're done with. Be aware of your own diet mentality thoughts and food rules. It could be helpful for you to write these down as they come to mind. You can pick one diet thought or food rule at a time and work through them - think about where they stem from, why they come to mind, why they are wrong. This might be difficult to do on your own, so it might be a good idea to tackle them with a dietitian or registered nutritionist who specialises in intuitive eating. Say goodbye to the tools of dieting. Get rid of that scale, it only serves to keep you focused on your weight and does not help you get back in touch with your inner intuitive eater. Constantly weighing yourself can be disappointing, leave you feeling frustrated, and can be a real barrier to allowing your body to guide your food choices. Self-compassion. The world we live in is one that is pretty obsessed with weight loss, having the 'perfect’ body, and fitting into a certain standard. It is no wonder that you have been stuck in the dieting mindset for so long! 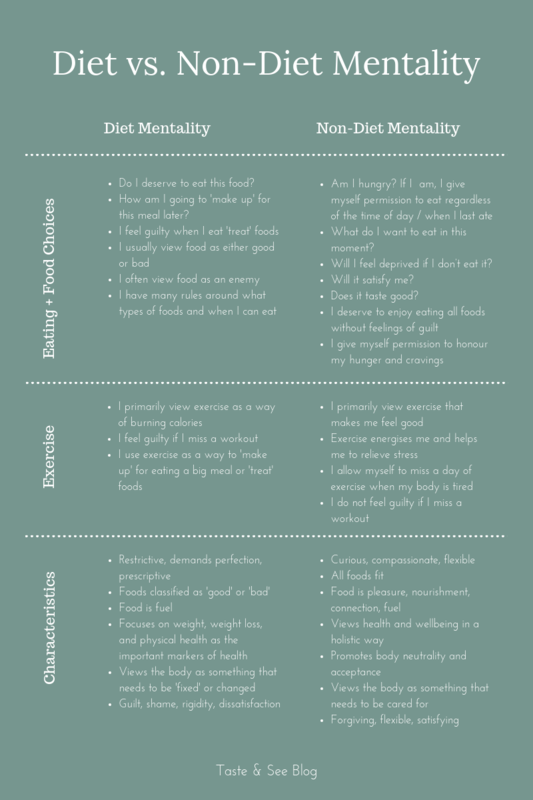 I have put together a non-exhaustive list of some common thoughts and beliefs associated with both a diet and non-diet mentality. It can be helpful to read through them and ask yourself where your thoughts tend to lie. If you are feeling a bit overwhelmed reading through this, put it away for a bit and come back to it when you're feeling ready. Take one step at a time - learning how to eat more intuitively is a process that takes a lot of self-compassion, time, energy, and debunking many of the beliefs that we have held in the past. Tribole E, Resch E. Intuitive Eating. 3rd ed. USA: Griffin; 2012. Caplan H. WTH is a "diet mentality"? [Internet]. 2018 Jan 10 [cited 2018 Nov 10]. Available from: http://heathercaplan.com/nutrition/what-is-a-diet-mentality/.